Fitness trackers of all sorts exist, ensuring users who want to set strong fitness goals can accomplish them with ease. Not all are made the same though, with varying options available on the market to give each person the desired features they want while on their fitness journey. Tracking distances, steps, and calories burned are simple features on almost all trackers. Go above and beyond by choosing a device that has cardio options and music as well to help make the most of your gadget. The TomTom Spark 3 GPS watch goes above and beyond the typical fitness tracker capabilities. It offers cardio settings and music options that are not usually seen, making it a worthwhile purchase. The strap hooks and clips to keep it safely on your wrist while you complete your activities. Enjoy the sleek design and snug fit that rests comfortably on your arm. Both small and large sizes are available. If you’re a petite person and you tend to wear small sizes, the small may fit you well. Most women choose this size. Men often select the large size to ensure a proper fit. The small has a slightly lower price thanks to the size difference, so it can save you a bit to choose it if you think it will fit. It also comes in both black and aqua, giving you two color choices so you can pick a style that’s more you. The price remains the same no matter which color your select. Known as your personal fitness trainer, the TomTom has all you need to stay motivated. The real-time performance results keep you motivated to do better, while the insightful information provided by the app gives you guidance on what to work on in the future. Use the advanced training modes to get in a harder workout and use the personalized workout options that are coming soon. Choose from five type of workouts on the fitness screen. You can pick between a fat burn, endurance, fitness, speed, or power. Download the appropriate app to get started using the device. TomTom MySports helps you analyze your workout stats and share them for others to see. There is also a route exploration option that allows you to upload different trails to your watch so you can view them easily and choose a new path each time you go out for a jog. In the box you’ll find the device itself, already set up and held securely within the strap. It also comes with a pair of bluetooth headphones that you can use to listen to music while you run. The charging cables and additional connector pieces come in plastic baggies that you should keep safe for later use. One charger comes in a package for the tomtom spark 3 while the other is intended for the headphones. Additional earbuds also come included. Follow along with the provided guidebook to set up the device and get started. The device comes in two colors and two sizes. It is waterproof up to 40 meters. Offers a multisport mode to track indoor and outdoor activities. Has a built-in heart rate monitor. The default display does not show data. It has a lower than expected battery life. The wrist strap could hold up better so the watch doesn’t fall off easily. Some fitness trackers have multiple modes depending on the sport you’re playing. If you want to record data for your run, you have to use a different option than if you were to go for a swim. It can take a while to find the right mode and feature to use using these devices. The Tomtom Spark 3 Cardio + Music ensures easier use. You can set the multisport mode option to have the device track all your data no matter what you’re doing. Go the gym, head to the pool, work inside or out and all information will get recorded no matter what. The real-time metrics ensure you receive accurate information on your workouts. Use the data discovered to up your routine and challenge yourself each day. Your pace, distance, speed, and heart rate all get recorded, which you can view right on your wrist as you complete your activities. You can also view the details later on in the TomTom Sports App so you can learn how to make better progress in the future. The built-in heart rate monitor works all day, even when you’re not completing a sport. Look at your watch throughout the day no matter what activity you’re doing, or even if you’re sitting still, and see the difference between each thing. It can help you see where you’re overexerting yourself and when you could be doing more. A high heart rate may be necessary during workouts to ensure your blood is flowing and your body is working as it should to improve. If your heart rate remains low, your body isn’t working hard enough to get any benefit from the exercise. You can currently choose from a list of five workout options to help you get the best results. In the future, more content will get added, with up to five workouts included on the device. Whether you want to burn fat, work on endurance, fitness, power, or speed, each option is available for you to try. Try something different each day so you get to experience all the device has to offer. The TomTom spark 3 music player comes with Bluetooth headphones that make it easy to listen to your favorite jams on the go. The headphones come with contoured ear hooks that fit nicely over the ears so they do not cause discomfort while in use. They are even sweat and waterproof so they can be worn while you work out and even in the rain. They last up to four hours in one use, and pair with both your device and your smartphone. 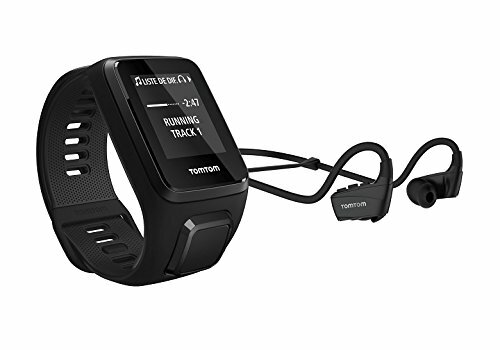 The TomTom spark 3 cardio addition has a multisport mode that allows you to track any sports you do. Whether you’re indoors or outdoors, the device tracks your movements and helps you monitor your runs, cycles, swim laps, and more. The advanced training modes that come with this component even ensure you can up your game and get in some further training for the activities you complete. They’ll make you get better faster. Use the fitness age feature to see how you measure up compared to others. Based on your heart rate activity and the maximum volume of oxygen used during your peak rate, you get an age calculated that tells you how fit or not you are at the time. Seeing this number helps you set better goals so you can work towards improving. The more fit you get, the better your age should calculate. The built-in heart rate monitor prevents you from having to wear a chest strap. The monitor sits on the underside of the watch, touching the top of your wrist at all times. You can use it to see how hard you’re working during a workout to determine if you should push harder or back off before your rate gets too high. You can even set a specific target heart rate zone so you can make the most of your workouts. Five different zones are available to try. The built-in music player can hold up to 3GB worth of songs. That number equates to roughly 500 songs stored in your device for you to listen to while you run, swim, or handle any other fitness duties. Set a playlist that will get your heart beating and your mind motivated and head on out for your fitness routine. You can wear the watch all day if you want, since 24/7 tracking is possible with this device. Not only will it record your heart rate, calories, and steps, but it will also monitor your sleep patterns. These details offer deeper insights into how your mind and body works so you can use that knowledge to your advantage and set better fitness goals. The GPS tracking feature doesn’t only monitor your location while you’re on the move. It records the full distance you traveled, the speed in which you got there, and your overall pace throughout the duration. After your walk or run you can use the TomTom Sports App to see the full map and live streamed data of all you did. The activities and information show up on the app for you to look at and make note of for future reference. Waterproof – The waterproof sport watch allows you to track your fitness both in the gym and in the pool. Track your laps in the water or your miles while jogging for a full fitness record. The device works up to 40 meters. Route Exploration – When you run, take a new route each time. The Route Exploration app allows you to find different paths so you can partake on a different adventure each time you go out. Fitness Age – Find your fitness age with the help of this handy feature. The device monitors your oxygen levels at your peak heart rate to estimate your age and see how fit or not your body truly is at the time. Use this information to improve your workouts so you feel better and more your age than before. Bluetooth Headphones – The cardio + music addition of the Spark 3 comes with bluetooth headphones. With their contoured shape that fits easily over the ears, you can get a comfortable listening experience while you jog or exercising. The headphones are also sweat-proof and waterproof ensuring an even more comfortable experience. Heart Rate Monitor – With a built-in heart rate monitor, you can receive accurate recordings of your heart rate no matter the activity. See what it is when you’re sitting still or on the run to know how exercise impacts your heart health. Are you looking to see what others have said about your device? Knowing what previous buyers have found out about something you’re hoping to buy can help make the purchasing process easier. Look at what reviewers have said about the Tomtom Spark 3 and rest assured that you’re getting a good deal others have boasted about in the recent past. Users rank the Tomtom Spark 3 as one of the best thanks to its inclusion of features above other Tomtom versions. The Cardio + Music option has everything a person needs to track their fitness routine, set goals, get their fitness age, see their heart rate throughout the day, and much more. With route exploration, advanced training modes, a built-in music player, and smartphone notifications this device has what it takes to make fitness worthwhile and fun. While most customer reviews remain positive, a small percentage have had some negative things to say about the device. Many agree that they like the device overall, but the software or app it uses is hard to sync. There are glitches at times or the device simply won’t pair up at all. With a restarted device or app, many users get it to work the second time. Apart from the few customer critiques, the overall tomtom spark 3 review has remained positive. The infrequent instances of negativity often stem from first attempts or user error. Those who give the device a try for a little longer say they have a positive outcome. Based on the tomtom spark 3 review from others, it’s easy to see why the device is so well liked. This gadget is ahead of the game in terms of the many features it combines to make an ideal fitness tracker. With music capabilities, cardio advancements, tracking options, and more, the Tomtom Spark 3 Cardio + Music device provides a solid option for those looking to improve their fitness goals.